EghtesadOnline: As the intense rally persists in the foreign currency market, the Central Bank of Iran issued a statement on Tuesday to assure the public that the bank's main concern continues to be provision of essential goods for the people. Stressing that the bank will use all its capacities to meet the country's needs, the bank pledged to offer each greenback at the official subsidized exchange rate of 42,000 rials for importing essential goods. The statement, published on CBI's website, came as the rial continued its sharp slide on Tuesday. According to reports from the open market, the US dollar was being traded for as much as 138,000 rials, up from Monday's 130,000 rials. The US currency's exchange rate had crossed the resistance level of 12,000 rials on Sunday. The rial has touched a series of record lows against the US dollar in recent months, Financial Tribune reported. On Sana, the website dedicated to reporting average exchange rates from money changers, quoted the dollar's exchange rate at 105,876 by midday. Sana's exchange rate tends to tilt toward the secondary market rate that is lower than those dealt by exchange shops. The euro was up 7.41% against the rial and fetched 160,170 rials and the pound gained 7.51% and was traded for 177,440 rails. In its statement, the CBI released updated figures, saying that since the beginning of the fiscal year on March 21, more than €5.5 billion have been allocated to import essential goods. It adds that by accounting the currency revenues of petrochemical goods and other export items, the hard currency flow in the secondary market has amounted to over €3 billion. The currency in the secondary market, it said, had been mostly used for importing raw materials, machinery and staple food. In the Secondary Forex Market, importers and exporters are allowed to agree to a negotiated exchange rate for making transactions. The gold coin market was also bullish on Tuesday, with the benchmark Bahar Azadi gold coin gaining 1.96% and trading for 46.80 million rials ($442). The gold coin rally has been a major source of volatility along with the currency crisis. Gold has traditionally been a safe haven asset for Iranians in times of economic upheaval. Several schemes, including a large-scale presale by CBI at attractive prices, have failed to calm the gold coin market. CBI is trying to calm the volatile currency and gold markets through market mechanisms and less intervention. On August 6, it eased foreign exchange rules and allowed money exchangers to resume work at open market rates as part of the latest rescue package. 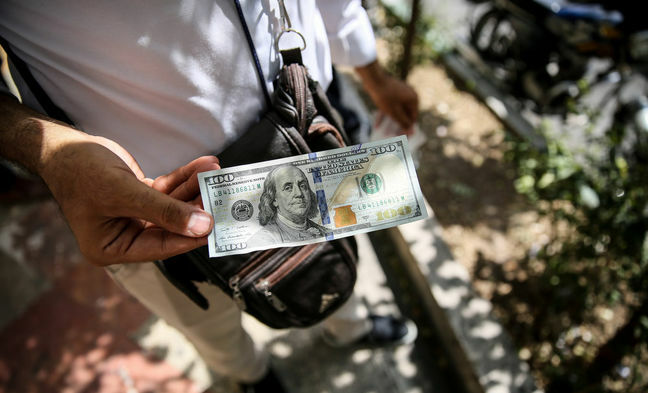 The fresh strategy came after the government decided to unify the US dollar's exchange rate at 42,000 rials on April 9 in response to the rial's freefall. CBI Governor Abdolnasser Hemmati has blamed liquidity growth as the wellspring of the country's economic woes. He rejected rumors that the bank intends to raise interest rates from the current 15% to 23%. The total volume of liquidity in Iran stood at about 15.82 quadrillion rials ($358.72 billion) at the end of the first quarter of the current fiscal year on June 21, the Central Bank of Iran last month. This signifies a year-on-year growth of 20.4%, the regulator said in its latest report published on its official news website. Banks' overdrafts from the central bank, the pile of bad debts in the banking system and the government's payment arrears to banks are cited by analysts to be the main reasons for the explosion of liquidity that has tripled since President Hassan Rouhani took office in August 2013.